Even though we’ll be using harnesses to take as much of the pull as possible on the long runs, we’re doing some training to strengthen our backs, including pull ups and rows. This is aside from the fact that we have only just started to learn how to kite buggy with just a month to go! So we are doing a lot of training controlling the kites in a variety of conditions so we can try and pick up the skills to avoid getting hurt. We have spoken to experts in the sport and got lessons from Kevin at SB kites which has been invaluable. When the wind is fails (even with the stats as good as they are in August there will still be some days like this), or when the wind is too strong, or when there are too many obstacles to buggy safely, we’ll need to drag the buggies and all our gear using shoulder tow lines from BuggyBags.co.uk.So a good amount of cardio fitness will come in useful too. Better get back to the gym then…! Hauling - although we'll have a lot more gear than this! 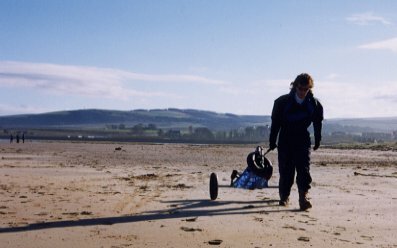 This entry was posted in Buggy Bags, Buggy Bags, Gear, Inspiration, Journal and tagged kite buggy, kite buggy expedition, training, walk of shame lines by Harry Thuillier. Bookmark the permalink. Get in contact with Louis Tapper (if you already haven’t. He did a solo, unsupported kitesurfing 2000km along the brazilian coast last hear. I’m sure he will be able to help you with details on the beaches. Quick question. What will you do about the river crossings? Hi Plummet, thanks for the message. Yeah we heard about Louis Tapper from Fabio Nobre at Club Ventos ported kites – I’ve contacted him but it seems he’s a bit off the radar at the moment. For the rivers in the more populated areas we’ll be using rafts which the locals and tourists use to go across with 4×4 buggies. For the more remote areas we’re just going to go inland and go around – will be a bit of walking with the buggies! Hi Plummet, thanks we’re in contact with Louis now who has given us a lot of advice on the location, and put us in contact with several locals who are able to help out with accommodation and knowledge of the route. Louis is currently in Morocco but still took time out to skype me with a load of tips which have been really useful. Regarding river crossings, we’ll be going inland to cross them in cases where there are no rafts or boats to help out, currently plotting a detailed route on google earth now. Search Louis on Face book. He’s in Europe at he mo but seems to be updating facebook regularily. PS big foot buggies float. take an couple of inflatables and fly across the water crossings! PSS I heard winds might be up to 45 knots? if so don’t do it! You will literally die. Wait until the winds are sub 30 knots. However we’d have to be pretty sure the water wasn’t too fast flowing or deep so probably not going to go with this tactic unless it is a really tiny stream! Regarding winds – if they’re too gusting to 45 knots and too strong for the 4m Access XTs we won’t fly, we’ll just walk. Matt Taggart at Ozone has been in winds above 50 knots with these kites, although granted he is more experienced and probably wasn’t hauling all his gear as well! So yes, if the winds are too strong we’ll play it safe. They tend to be stronger in September, and we’re starting on 25th July. We’ll also have time to acclimatise to stronger winds, because they are lighter further down the coast towards Natal but build in strength as we go north to Ceara and Jeri.